I just love this passport save the date, it's got to be my new favourite! Emma and Steven were looking for something special to send their guests with news of their wedding on the beautiful island of Nassau in the Bahamas. After deciding to go for the standard four sided passport design and the navy and gold colour scheme chosen, Emma and Steven wanted to inject some of their personalities into the overall design. I think the fun photo they chose to include on their official passport page certainly shows a couple who enjoy their holidays. While the polaroid style snapshot of Nassau Beach is only a taste of what their guests can expect to enjoy when they join them at their dream wedding. The beautiful quotes included at the bottom of the passport page and also on the back cover are the finishing touch which makes this save the date truly personal and unique. "Love is like the wind, you can’t see it but you can feel it all over"
I can't wait to start work on Emma and Stevens wedding invitation which I'm sure will be just as much fun! If you're looking for a personal way to send guests Save the Date information for your upcoming destination wedding, any of my designs can be customised to suit the wording you require. 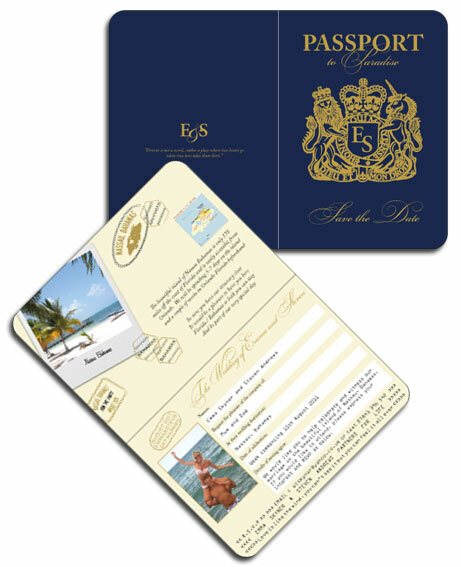 Wedding Passports, Airline Tickets, Luggage Tags and Postcards all have the potential to be truly unique ways of inviting guests to your wedding abroad. Click here to contact me to discuss your ideas. Passport Save the Dates, are they really necessary? In my opinion, they are, especially if you're planning a wedding abroad. They obviously don't have to be a Passport Design, Luggage Tags and Postcards work equally well. Giving your guests a firm date (or even rough date) and location so they can at least start planning the logistics of joining you for your wedding will always be appreciated. Plan to send them out between 6 and 12 months before the wedding so you really give guests as much notice as possible. Click here to read more about Save the Dates. This is just one example of a Passport Save the Date. View more examples of Wedding Passports here, all my designs can be customised and used as Save the Dates, Invitations or even Wedding Programmes if you fancy.